In an effort to make the 35 percent U.S. corporate tax rate more competitive with the rest of the world, Congressman Tom Emmer (R-MN) has introduced an interesting bill (H.R. 4518, the “Create Jobs Act of 2016”) that seeks to tie the U.S. corporate tax rate to the average rate imposed by our major trading partners in the OECD. Emmer’s catch is, the U.S. federal corporate tax rate should always be pegged 5 percentage points below the simple average of the OECD nations, excluding the U.S. So if the OECD average declines, the U.S. rate would decline with it, but always 5 percent lower. Currently, the simple average corporate tax rate levied by the 33 non-U.S. OECD nations has dipped below 25 percent, a full 10 percentage points below the U.S. federal rate. The gulf is even greater when we include the average of state corporate tax rates. Given this disparity, it is worth considering what would be the economic and revenue effects of cutting the federal corporate rate to 20 percent, or 5 points lower than the OECD average. Using the Tax Foundation’s Taxes and Growth Macroeconomic tax model (TAG), we can measure the long-term effects of a 20 percent corporate tax rate on key economic factors, such as GDP, capital investment, wages, and jobs. 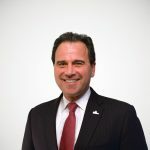 Additionally, we can measure the impact of a lower corporate tax rate on federal revenues in three different ways: in conventional (static) terms; after accounting for the macroeconomic effects (dynamic terms); and, accounting for the reduced amount of profit-shifting as a result of the lower corporate tax rate. The model shows that reducing the corporate tax rate to 20 percent would deliver significant long-term benefits to the U.S. economy and workers. As the nearby table shows, a 20 percent corporate tax rate would boost the level of GDP by 3.3 percent over the next decade. In today’s dollars, that means the size of the economy would be $621 billion larger than it is otherwise expected to be. A lower corporate tax rate would reduce the cost of capital which, consequently, would lead to a nearly 10 percent increase in the size of the capital stock. When workers have better tools they are more productive and earn more. Thus, the model finds that wages would rise by 2.8 percent. In addition, the larger economy would create more than 641,000 full-time equivalent jobs. The model also finds that the larger economy and rising incomes would significantly mitigate the revenue losses that might result from such a deep rate cut. In conventional terms, cutting the corporate tax rate would be expected to reduce federal tax revenues by more than $1.6 trillion over a decade. But, as the nearby chart illustrates, this scoring method fails to account for the policy’s economic effects. By contrast, the TAG model finds that the larger incomes and GDP actually generate $910 billion more tax revenue than the static estimate. This means that overall “cost” to the Treasury of the lower rate would fall to $718 billion over a decade. However, as the chart shows, the annual revenue losses may start high—about $126 billion—but turn to positive by the end of the budget window. Thus, the lower corporate tax rate begins to “pay for itself” after about a decade. Accounting for the macroeconomic effects of the lower corporate tax rate does not tell the whole story. A number of academic studies have found that our high U.S. corporate tax rate is causing companies to shift a significant amount of profits out of the U.S. to countries with lower tax rates. By implication, these studies suggest that cutting the corporate tax rate would reduce the amount of profit-shifting and, thus, expand the domestic corporate tax base. 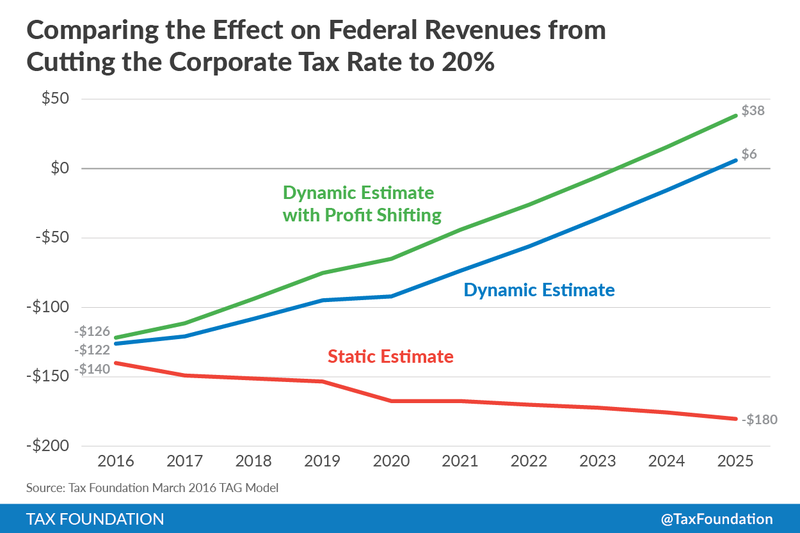 The TAG model is able to measure these effects and estimate how much additional corporate tax revenues can be raised with a lower corporate tax rate. Using a very conservative assumption on the amount of profit shifting that would be averted with a lower tax rate, the TAG model estimates that $228 billion in additional revenues would be raised with the 20 percent tax rate over a decade because of the larger tax base. These new tax revenues reduce the 10-year revenue loss of a 20 percent corporate tax rate to $490 billion. However, as the chart shows, these costs are front-loaded. After about seven years, the combination of the larger economy and the reduced profit-shifting turn the annual revenue losses into a $38 billion revenue gain for the Treasury. Over time, these annual gains would make up for the initial losses. One of the biggest obstacles to lowering the U.S. corporate tax rate to a competitive level is the potential loss of tax revenues and the impact on the federal deficit. However, when we account for the macroeconomic effects of lowering the rate and the bonus revenues from reduced profit-shifting, we find that the costs are temporary while the economic benefits are permanent.